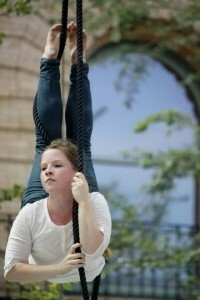 Meg specializes in ground contortion as well as both static and single point trapeze. Multiple acts available including Cat with Ball of Yarn contortion, Snake trapeze, Burlesque contortion. Full-length (45 minute) duo show, Piece of Me, with musician Myrrh Larsen also available. Show is a modern day fairy tale that tells the story of Gideon Barstow, poet and musician from the 1930's, and his descent into love and eventual madness from his interactions with an enchanting fairy creature. Show includes trapeze, contortion, dance, mime, and character work, as well as original music performed live. 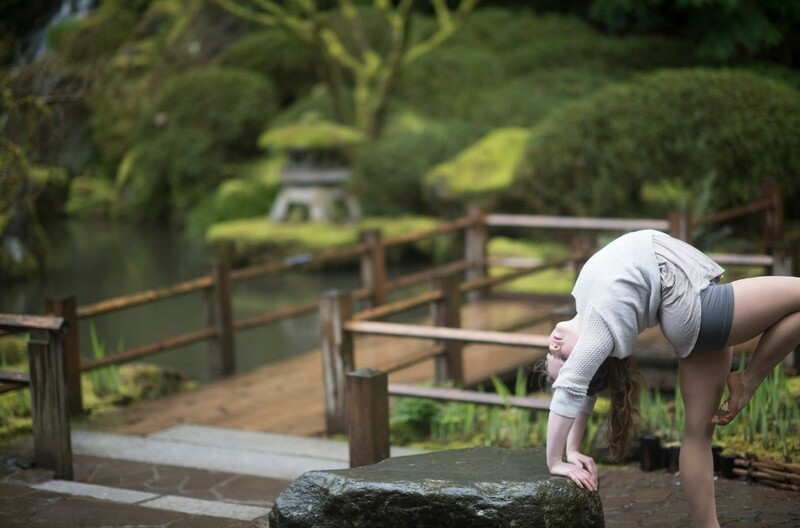 Meg Russell is a contortionist and aerialist based out of Portland, OR. She has trained circus arts for 7 years and has performed all over the Pacific Northwest, as well as in New Orleans, Scotland and Italy. Meg's training began at the Circus Project in Portland, and continued with a one-year stint studying circus arts abroad. 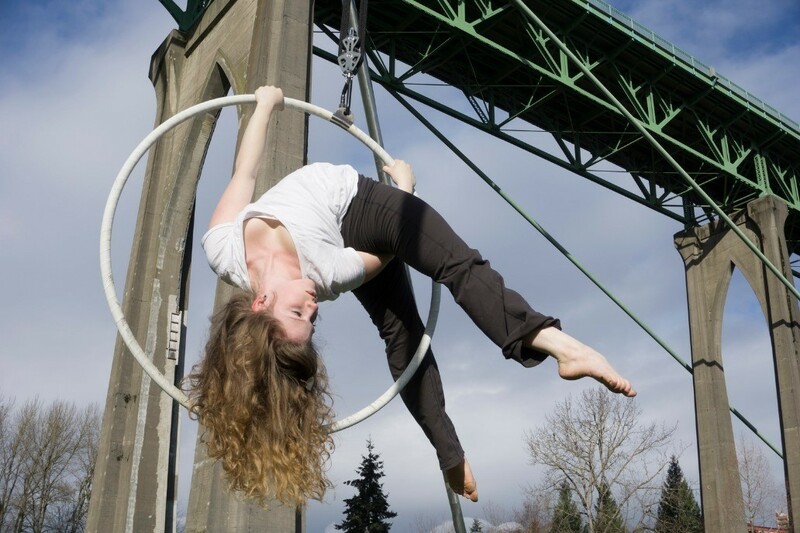 She now trains and coaches at the Circus Project and Night Flight Aerial in Portland, OR. Meg has performed on multiple apparatus, including static trapeze, single point trapeze, rope, aerial prism, and lyra. She also has ground contortion acts and has worked speaking a ... nd non-speaking character roles. "My Infringe will be ending on a high note tonight, as it has been a joy and pleasure to watch and work on this show. Piece of Me is an otherworldly blend of rock show and fairy tale. Myrrh Larsen, with the help of some old letters and his magical guitar, summon a captivating creature, Meg Russell, whose incredible dancing, dazzling aerials and, jaw-dropping contortions make it a dreamy indie video come to life." "I feel very fortunate to have stumbled upon this show at the Valiant Theatre and Lounge last night. Myrrh Larsen's songwriting and musical performance was wonderful, and Meg Russell's aerial performance was breathtaking. The combination was devastating in the best way." Meg Russell is a tiny dynamo. Her unique blend of strength, grace, flexibility, and power is truly Megnificent! "I once hired Meg because another performer of mine had worked with her before. She was simply Amazing from start to finish. So professional, such a delight in her attitude, punctuality and in her stage presence. I honestly didn't think she would be able to outdo herself but then I was blessed to attend a show where she was buzzing around a Loop in ways I just didn't think were possible!!" I have performed at numerous corporate events, as well as public shows. Corporate events have been performed through Animate Object Physical Theater based out of Seattle, WA, and have varied from small intimate events of 40 attendees, to large events ranging in the thousands. Public shows include Night Flight Aerial's annual "Fright Night" shows and Night Flight's "Sea of Dreams", a co-creation with musician Myrrh Larsen called "Piece of Me" which we have performed in Portland and at the New Orleans inFringe Festival. I have also worked with Prismagic theater (Portland, OR) on multiple shows. ... 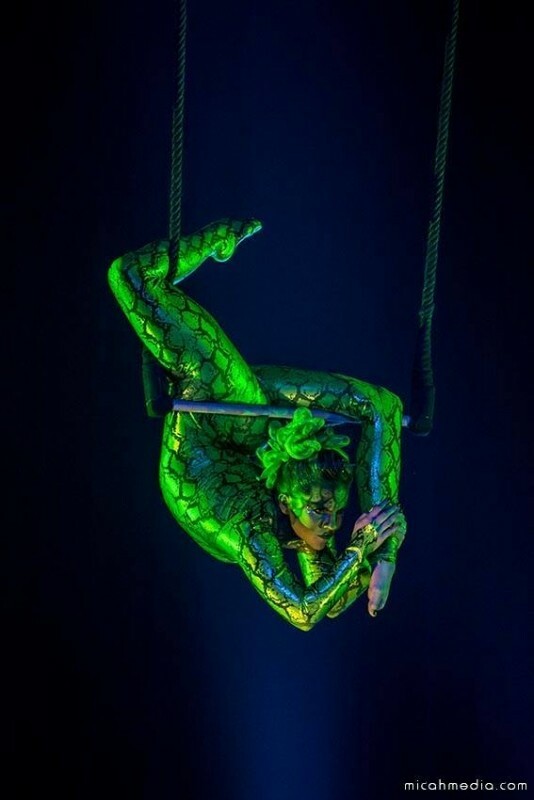 I primarily perform contortion and single point trapeze, but also have experience performing lyra, rope, lollipop lyra, and aerial prism, and as a supporting character. Wedding Reception Entertainment Birthday Party Entertainment Private Parties Corporate Events Cocktail Receptions Cruise Line Entertainment Christening Entertainment Product Launches Trade Shows Christmas Party Events Bar Mitzvah Bat Mitzvah Gala Dinners Jewish Weddings After Dinner Entertainment. Hiring a Contortionist, Tips, Advice and How to Book!